Coilover Suspension Kit For VW Transporter T5 & T6 (03-18). VW Transporter T5 & T5.1 Facelift (Apr 2003 to 2014); VW Transporter T6 (Apr 2015 to 2018) &##x25cf. 2 x height adjustable front coilover units; 2 x rear lowering springs; 2 x rear alloy ride height adjusters; 2 x rear fixed uprated shock absorbers; 1 x adjuster tool &##x25cf. Will NOT fit any of the T32 chassis models or vehicles with fork-type front shock absorber fitting; NOT suitable for vehicles with auto/self leveling suspension &###x25cf; READ MORE.. PRO SPORT DZT-Line Street Coilovers. VW Transporter T5 & T5.1 Facelift (Apr 2003 to 2014). VW Transporter T6 (Apr 2014 to 2018). 2.0 / 2.0 TSI (including 4motion). 2.0 TDi / 2.0 BiTDI (including 4motion). 2.5 TDI (including 4motion). 3.2 V6 (including 4motion). Includes Kombi, Shuttle, Caravelle, Multivan, California & Sportline. Front Max Axle Load: 1710kg. Rear Max Axle Load: 1720kg. Front drop: 45mm to 75mm. Rear drop: 45mm to 70mm. T32 chassis models and any vehicles with fork-type front strut fitting. 2 x height adjustable front coilover units. 2 x rear lowering springs. 2 x rear alloy ride height adjusters. 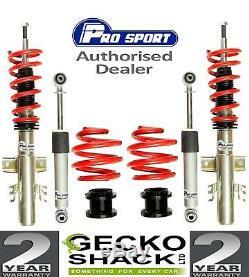 2 x rear fixed uprated shock absorbers. Zinc-plated struts to help reduce corrosion. High quality Chrome-Silicon powder-coated spring. Fixed rate damping is approximately 25-30% stiffer than OE suspension allowing for a firm yet forgiving ride. Vehicles with factory fitted lowered suspension will not drop as much as stated in the above figures. This Pro-Sport coilover kit is designed to fit all models listed above fitted with OE spec wheels & tyres but some aftermarket combinations of wheels and/or tyres may require wheel spacers to be fitted. We are able to supply these if the need arises. In accordance with Prosport, instructions are purposefully not supplied with any of the kits as it would incorrectly give indication/suggestion that a non-professional could be capable of fitting these suspension products. These kits are not a DIY item and any advice given could be considered (legally) as giving acceptance of it being a product for amateur/DIY installation. Any suspension kits should only be installed by a competent professional service as they are a `safety critical item. The item "VW T5 & T6 TRANSPORTER T26 T28 T30 COILOVERS PRO SPORT SUSPENSION LOWERING KIT" is in sale since Monday, September 17, 2018. This item is in the category "Vehicle Parts & Accessories\Car Tuning & Styling\Performance Suspension\Other Performance Suspension". The seller is "geckoshack" and is located in Salisbury. This item can be shipped to United Kingdom.